The Isole Tremiti are an archipelago in the Adriatic Sea, north of the Gargano Peninsula. 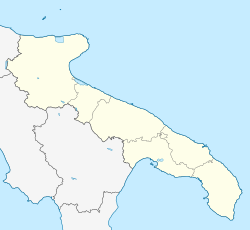 They constitute a comune of Italy's Province of Foggia and form part of the Gargano national park. The name of the islands relates to their seismic hazard, with a history of earthquakes in the area: tremiti means "tremors". A view of San Nicola island from the nearby San Domino island, with the Abbey of Santa Maria a Mare fortified complex. The islands were used for the internment of political prisoners during Benito Mussolini's Fascist regime. This was nothing new: two millennia earlier Augustus had exiled his granddaughter Julia the Younger to one of these islands (then named Trimerus in Latin, maybe from Greek Trimeros, Τρίμερος, meaning "three places" or "three islands"). The islands are now an important tourist attraction because of the clear waters surrounding them. Up to 100,000 visitors come to the islands in the summer season. Ferry services from the mainland operate from Termoli, Vieste, Rodi Garganico and Capoiale, while Alidaunia offers flights from San Domino Heliport to Foggia and Vieste. San Domino is the most developed island for tourism and has the only sand beach in the archipelago. San Nicola is where most of the population resides. It is the site of a monastery where a monk named Nicolò was buried. Legend has it that every time someone tried to move his corpse off the island, a violent storm would break out, preventing navigation around the island. Capraia (or Capperaia) is deserted. Cretaccio is a large block of clay and thus uninhabited. Pianosa is a small, uninhabited island. Its maximum elevation is 15 metres (49 ft). Sometimes, during storms, the waves cover it. Inhabited since late Iron Age times (4th-3rd centuries BC), the Tremiti Islands have been a confinement place since ancient times. Roman emperor Augustus had his granddaughter Julia the Younger transferred here, where she died after 20 years. In the Middle Ages the archipelago was ruled by the Abbey of Santa Maria a Mare ("Holy Mary on the Sea") at San Nicola island, apparently founded here in the 9th century by Benedictine monks from Montecassino. In the 13th century the abbey had gained its autonomy from the father monastery, and owned lands from the Biferno to Trani on the Apulian mainland. After an alleged period of moral decadence, in 1237 the Benedictines were replaced by the Cistercian order. In 1334 the abbey was sacked by Dalmatian pirates from Omiš. In 1412 the Lateran Canons took ownership of the islands, and restored the abbey with cisterns and fortifications which withstood the assault of Ottoman ships in 1567. The abbey was suppressed in 1783 by King Ferdinand IV of Naples, who set up a penal colony. During the Napoleonic age the islands were a stronghold of Joachim Murat's supporters, who resisted a British fleet in 1809. In 1843, to repopulate the islands, King Ferdinand II of Two Sicilies moved a number of people from Naples' slums to the islands, who mostly became fishermen. In 1911, about 1,300 Libyans who had resisted Italian colonial rule were confined to Tremiti. After a year, around one-third of them had died, mainly from typhus. During the Fascist era, the archipelago continued to perform its function of confinement, detaining, among others, Amerigo Dumini, and future president of the Republic, Sandro Pertini. Mussolini had hundreds of homosexuals deported to San Domino, in 1938. No law prohibited homosexuality at the time, and Mussolini also denied its existence, saying that, "In Italy there are only real men". However, suspected or reported homosexuals were rounded up and deported. The conditions on the island were very difficult, and a few died. San Domino had the distinction of being the only internment camp in which all the prisoners were gay. Mussolini's regime had unwittingly created a part of Italy in which men were expected to be openly gay. The dormitories were spartan, with no electricity or running water. A bell would ring at 8 p.m. each day, signaling that the men were no longer allowed to be outside. For the remainder of the night they were locked in their dorm rooms, under police supervision. The internment camp closed in 1939, as Italy became enmeshed in the beginnings of World War II. In May 2012 the provincial government caused a scandal by attempting to sell-off blocks of land on two of the islands for development for a reported €4m. Local environmental groups campaigned vigorously and in the event there were no bidders. Mancini, Enzo (1979). Isole Tremiti, sassi di Diomede: natura, storia, arte, turismo. Milan: Mursia. ^ Johnston, Alan (13 June 2013). "A gay island community created by Italy's Fascists". BBC News. Retrieved 19 March 2017. ^ Staniscia pio luigi (24 July 2007). "TREMITI ISLANDS - Ferry schedule". Lecinqueisole.it. Retrieved 26 March 2013. ^ "Home Page". Alidaunia s.r.l. - Società di navigazione aerea (in Italian). Retrieved 19 March 2017. ^ a b c d Johnston, Alan. (2013, June 12). A gay island community created by Italy's Fascists. BBC News: retrieved 6/13/2013. ^ Squires, Nick (5 June 2012). "Italian austerity forces region to sell its rare mouflon sheep". Daily Telegraph. Retrieved 12 May 2013. Wikimedia Commons has media related to Isole Tremiti.